A handy discount on the best keyboard around. First of all, the Razer BlackWidow Chroma is an excellent keyboard. So good in fact, that we have it in the "best overall gaming keyboard" slot on our keyboard guide. So good, that I'm typing this on one right now. If you don't have one, and you're in need of a brand new keyboard, then you can find the Razer BlackWidow Chroma for £110 on Amazon—the cheapest its been since Black Friday. Don't let the "53 percent" saving listed on the page fool you, Amazon isn't saving you that much money, but it is often priced up above £130, and occasionally as high as £150. So this price of £110 is a decent deal. The reason we like the Razer BlackWidow Chroma so much is because of its list of features. The macro column, the USB passthroughs, and the RGB lighting all give it a slight edge over the Logitech G610 Orion, which was our previous favorite. 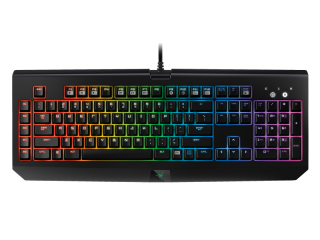 The keyboard works with Razer's Chroma lighting system, so you can customize your keys with RGB lighting to your heart's content. That said, we here at PC Gamer do believe gaming needs to grow up a bit with regards to crazy lighting and jagged designs. Razer has in fact just released the newest version of the BlackWidow Chroma, with V2. It brings some new switch options and a magnetic wrist rest, however you will of course be paying more for the new model.